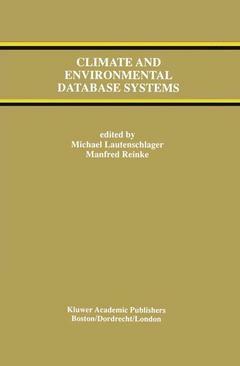 Climate and Environmental Database Systems contains the papers presented at the Second International Workshop on Climate and Environmental Database Systems, held November 21-23, 1995, in Hamburg, Germany. Climate and environmental data may be separated into two classes, large amounts of well structured data and smaller amounts of less structured data. The large amounts are produced by numerical climate models and by satellites, handling data in the order of magnitude of 100 Tbytes for the climate modelling sites and 1000 Tbytes for the recording and processing of satellite data. Smaller amounts of poorly structured data are the environmental data, which come mainly from observations and measurements. Present-day problems in data management are connected with a variety of data types. Climate and Environmental Database Systems addresses the state of the art, practical experience, and future perspectives for climate and environmental database systems, and may be used as a text for a graduate level course on the subject or as a reference for researchers or practitioners in industry. Foreword. 1. Introduction, M. Lautenschlager, M. Reinke. 2. Concept of the Climate Database System at the DKRZ, M. Lautenschlager. 3. The Evolution of a Space-/Earth-Science-Information System and its Directory Interchange Format, H. Schroeter, L. Olsen. 4. The CERA Data Model, I. Jessel. 5. The Climate Information System KLIS at the DWD, J. Behrendt, S. Rösner. 6. A Database Design and Implementation for Scientific Data Related to the MIPAS-Balloon-Spectrometer, O. Trieschmann, et al. 7. MIDAS - the UK Met Office Project to Replace its Climate Data Banks, J. Ward, P. Cowley. 8. The International Paleoclimate Database (PKDB), I. Lentner. 9. WATIS - The Wadden Sea Information System Experience from an Operational System, H.L. Krasemann, R. Riethmüller. 10. The Realization of a Climate Database for the Swiss Meteorological Institute, G. Haller, et al. 11. The Meteorological Information System at the Alfred-Wegener-Institute, G. König-Langlo, B. Marx. 12. Providing Map-Driven Database Access via the World Wide Web, B. Marx, et al. 13. A Distributed Administration System for Ocean Simulation Data, C. Dodge, et al. 14. SEPAN - Sediment and Paleoclimate Data Network, M. Diepenbroek, et al. 15. New Dimensions in Relational Database Technology for Spatial Data Management, H. Viehmann, et al. 16. EMPRESS MET: The Meteorological Database Management System Current and Future Development, Njai Wong. 17. Multi-Terabyte SMP Data Warehouse: The Cray CS6400/Oracle 7 Solution, B. Carlile. 18. Polar Data Directory Systems, M. Reinke, B. Marx.